A T-Shirt travelling the globe to spread the message Reduce Radon & Save Lives has been photographed outside London’s Houses of Parliament with specialist contractors, ProTen Services. 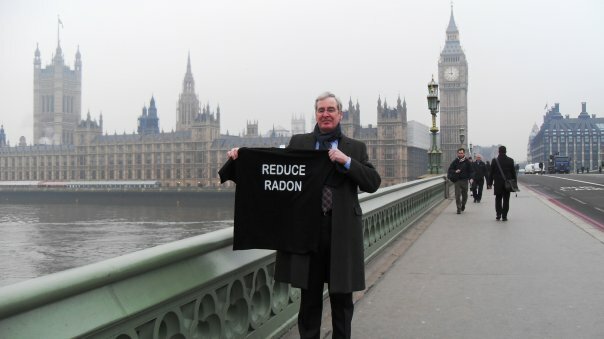 Bath, United Kingdom, February 24, 2010 — Martin Freeman, Managing Director of ProTen Services, posed with the Radon Tee outside the House of Lords, the House of Commons and Big Ben this week. Ministers at the Houses of Parliament are responsible for passing legislation in the UK, including the Building Regulations, which stipulate whether new buildings and extensions or conversions must be protected from radon. Currently, only properties located in certain areas of the country are required under Building Regulations to incorporate radon protective measures into the build.